Looking for reasons to visit Spain? We’ll give you one here – no wait, we’ll give you 12! Here are the 12 best Spanish festivals to visit in 2019! There are so many reasons to love Spain. 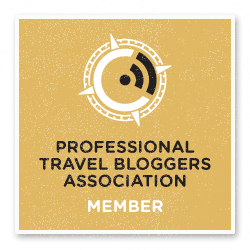 Let’s start – there are its cosmopolitan cities, charming countryside, hiking opportunities (Pyrenees baby! ), scenic coastline, wonderful climate, rich and diverse history – yet, you can’t say you’ve been to Spain until you’ve experienced one of many famous Spanish festivals. With this in mind. let’s look at 12 of the best festivals Spain has to offer. The Feria de Abril, also known as the Seville Fair, is a really fun Spanish festival, a flamboyant and colourful affair that happens two weeks after the Easter Holy Week. It is known as ‘Feria de Abril’ because it usually takes place in April – but since its dates is linked to Easter, it may also fall in May when Easter is late. The action happens in an area of the city known as ‘Real de la Feria’, which comprises 24 blocks. 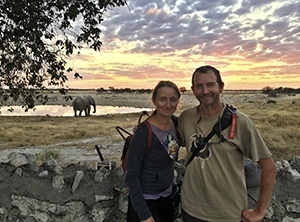 Here, you’ll find over 1000 casetas (small tents), where most of the fun takes place – there are also shows, circus events, and an amusement park. In Seville, most casetas belong to the city’s influential and wealthy, and require a pass to enter. If you do not have a pass don’t worry, there are seven public casetas for each district in Seville – they are likely to be crowded though. Inside the tents, food and drink are consumed freely with all-night parties that never seem to end. 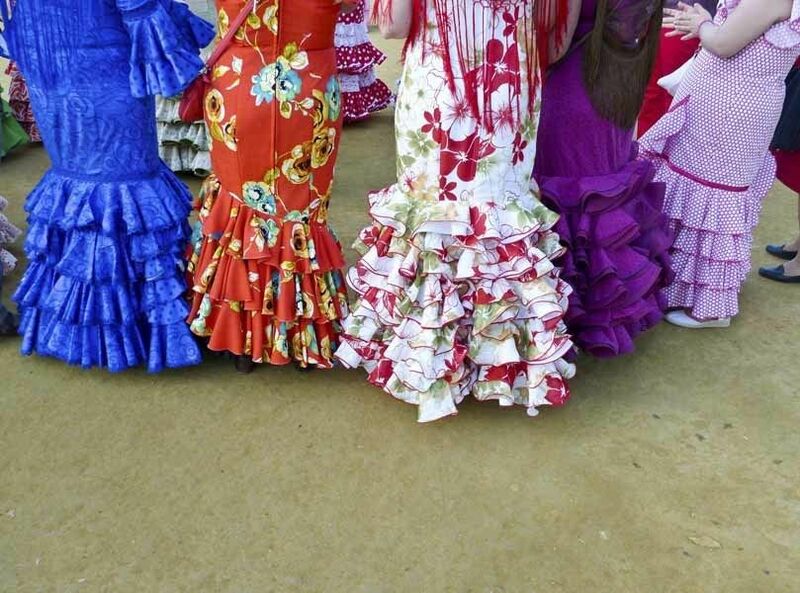 To join in, just get yourself a colourful traje de flamenco if you are a woman, and you are good to go! When will it take place in 2019? May 4th to May 11th. 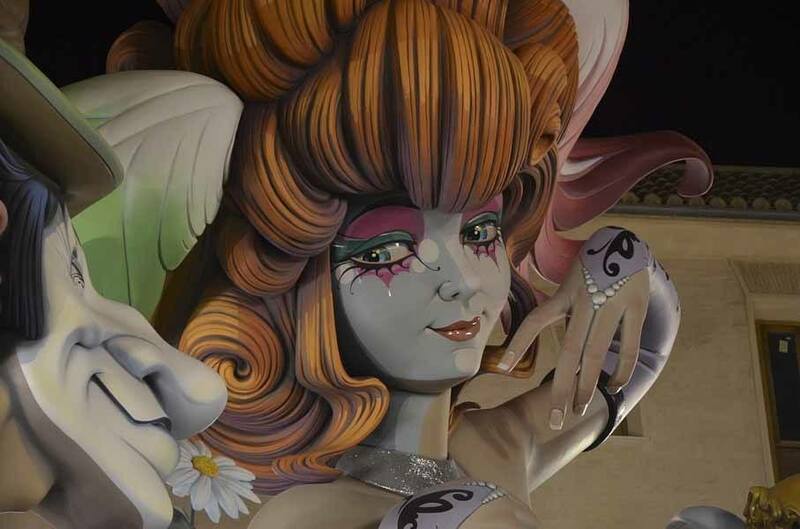 Don’t miss Las Fallas in Valencia! This is a very apt description of this Spanish festival, a true ‘mix and mashup of colourful madness’. Quite simply, the festival is fantastic and one of the best events in Spain. The festival takes its name from the ‘fallas’, monuments constructed by local people, which are burned at night to symbolise renewal. These massive structures date back to when carpenters used large torches called ‘parots’ to burn wood chips in front of their workshops just before spring. With time, carpenters started decorating the parots more and more, adding details and decorations, or modelling them after unpopular customers or people they didn’t like – so that burning them became a kind of ‘good riddance’. The parots slowly grew to become the fallas, massive constructions that can reach over five stories in height. They are normally caricatures of politicians in various sarcastic poses that suit the theme of the event. Mascletà – this is when the two and a half week festival begins in the Plaza del Ayuntamiento. Every day at 2 pm a traditional mascletà booms out, a display of gunpowder explosions. After this, many festival goers enjoy traditional Valencian food and drink. 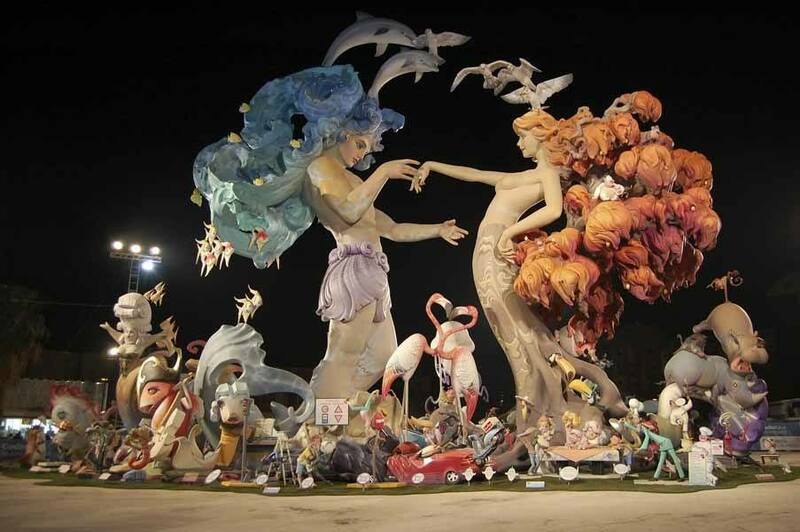 La planta – here, the fallas are constructed with the men and women who build them working hard through the night installing them. This happens in the final five days of the festival. Fireworks and the Nit del Foc – an incredible firework display is held for three consecutive nights at the Paseo de la Alameda. 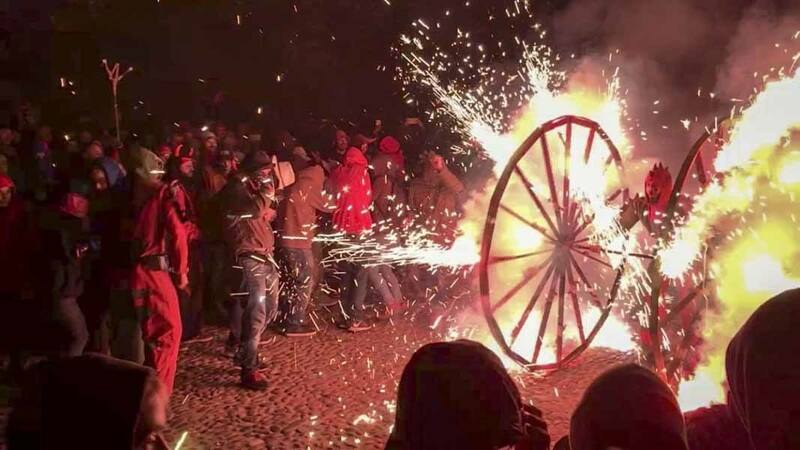 This is followed by the Nit del Foc (Night of Fire) which is held in the early hours of the morning. This display is the only one of its kind in the world thanks to the colours used and the nature of the fireworks involved. Prize Giving Ceremony – two days before the fallas are burned, each one is judged. There are over 750 for the judges to see, including children’s sculptures. Prizes are given to the ones the judges like the most. Ofrenda de Flores (Offering of Flowers) – the day before the burning of the fallas, the people that built them – the falleros and falleras – walk from their districts bringing flowers to the Plaza de la Virgin, to make a flower offering to the Patron Saint of Valencia. 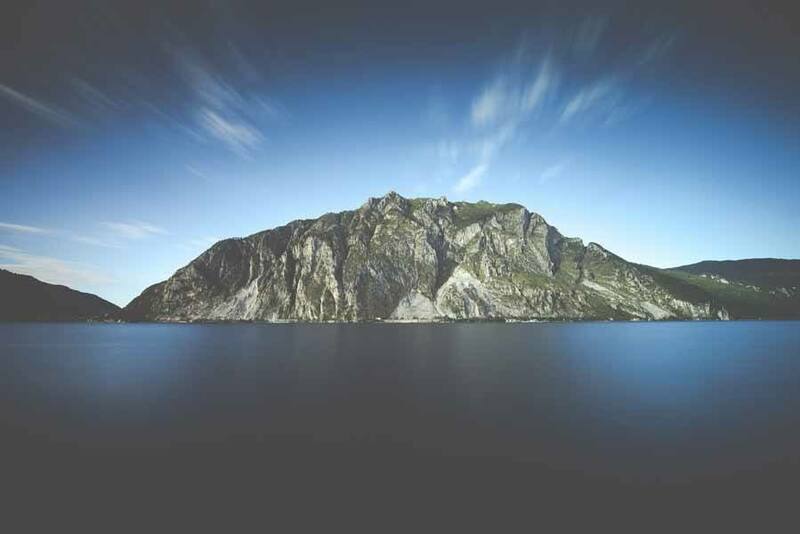 It is an emotional experience with people walking several kilometres to make the offering. La Cremà (The Burning) – On the last day of the festival all of the fallas are burned. This symbol of rebirth starts with the children’s sculptures at 10pm, followed by the larger monuments that are burned afterwards. After a firework display, the last falla in Plaza del Ayuntamiento is burned, ending the festival. The festival is the highlight of the Valencia tourism industry, and definitely a Spanish festival you should visit once in your lifetime! When will it take place in 2019? March 15th-19th. Don’t wear your best clothes at La Tomatina! Out of all the Spanish festivals, la Tomatina is definitely one of the best known and famous with people from all over the world – scenes of revellers throwing tomatoes to one another have been featured on guidebook covers, in movies, documentaries and more. The festival takes place in the town of Buñol, not far from Valencia, on the last Wednesday in August. The centrepiece of celebrations is the famous tomato battle, when locals and tourists run around the town streets throwing tomatoes at each other. Unlike most other Spanish festivals, whose origins date back several centuries, La Tomatina started being celebrated in 1945, after a character lost his mask during a parade. People found the occurrence hilarious, and started grabbing tomatoes from nearby stalls and hurling them onto one another. Over the last 70 or so years, La Tomatina become such a popular Spanish festivals that tickets sell out in no time. If you do want to attend, make sure you plan well ahead! Another well known Spanish festival that is worth attending, the Semana Santa (Holy Week) takes place just before Easter. Celebrations happen in various Spanish cities and change from place to place, but they usually include sombre parades with people in pointed hooks carrying crosses, banners and statues of their church’s patron saint, surrounded by burning candles. 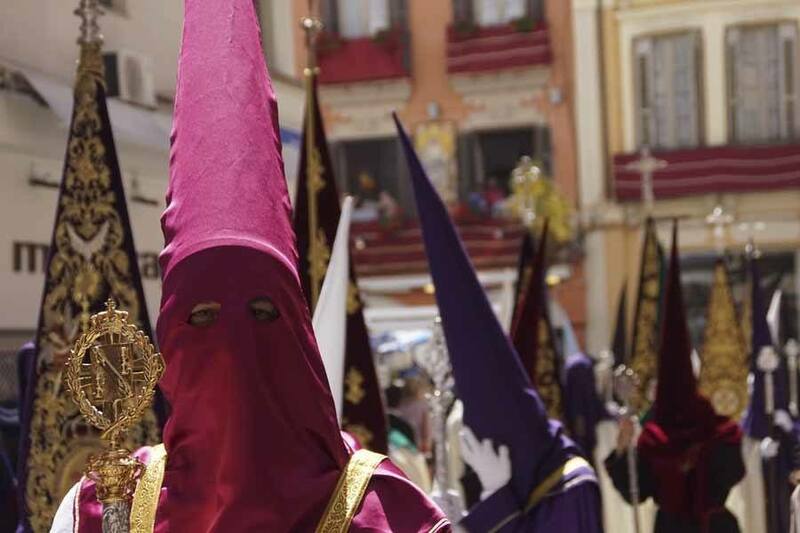 Some of the best places to see Semana Santa include Seville and other Andalusian cities, as well as Salamanca, Valladolid and Zamora. This Spanish festival is religious at heart and probably not as much fun as the others featured in this list, but seeing the parade and witnessing the devotion of locals makes it worth your while. When will it take place in 2019? April 14th to 20th. Barcelona is one of Spain’s most famous and visited cities – it is overrun with tourists year round, making it sound incredible that you can enjoy a festival with a true local flavour, only a short distance from the city centre. If you are visiting the neighbourhood of Gracia in August, don’t miss the Feria Mayor de Gracia, the coolest local festival in Barcelona. Locals and businesses compete for the most extravagant decoration, and the programme includes typical Catalan performances like the Correfocs, running through the crowd holding and twirling firecrackers on sticks, the Castellers or human castles, and the parades of the Gegants (giants) and Capgrosos (big heads). When will it take place in 2019? August 15th to 22nd. Carnival is a famous festival all throughout Spain, with locals celebrating the last days of merriment before Lent with fancy dress parades and revelry in the streets. The Andalusian city of Cadiz is one of the best Carnival celebrations in Spain – parties and parades last for about two weeks, with lots more carnival-related events taking place throughout the year. The main characteristic of Carnival in Cadiz is humour – local masked groups usually take inspiration from current affair events, reinterpreted in a sarcastic manner. This Spanish festival is not just about entertainment, but it is also a way to generate information and share opinions that go against mainstream culture. The best day to visit is the Saturday before Ash Wednesday, when virtually the entire city is masked and parties go on until late night. If you don’t have a mask, just wear colourful face paint and don’t miss this fun Spanish festival! When will it take place in 2019? February 28th to March 10th. Another cool Spanish carnival is the Carnaval de los Indianos held in Santa Cruz de La Palma, Canary Islands. Los Indianos was the name given to locals who went to work in America, made money, and returned to their native island with new traditions. This Spanish festival is also known as the ‘White Party’, because of the custom of throwing talcum powder over revellers. The party starts at 12 pm, when ‘the Indians’ are welcomed, and continue throughout the afternoon with lots of rum, cigars and Latin American dancing – there are lots of references to Cuban culture, the destination where many La Palma ‘Indianos’ migrated to. The party ends at night, with the symbolic burying of a giant sardine. When will it take place in 2019? March 4th. 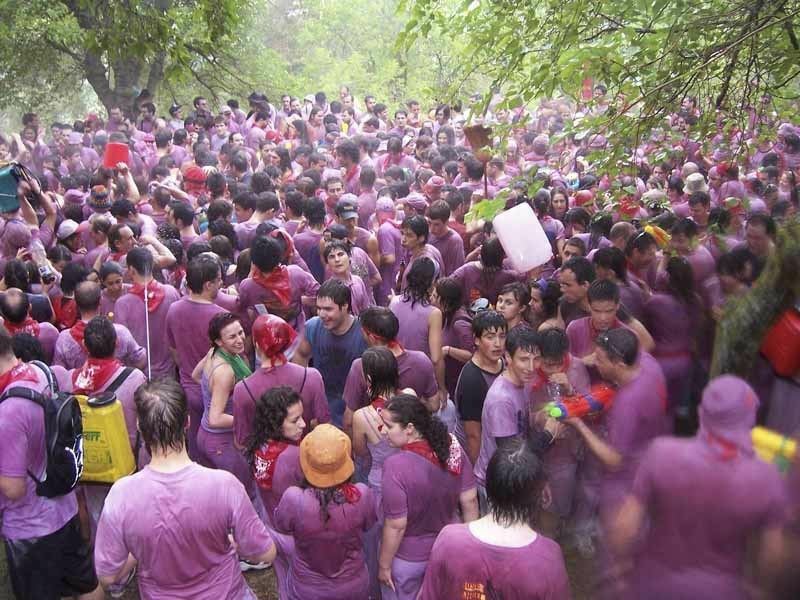 The Wine Battle of Haro definitely deserves to be in this selection of Spanish festivals – think about Songkran in Thailand, but with wine instead of water! Haro is in the La Rioja region, famous for its wine, so it only makes sense that their main festival involves COPIOUS amounts of delicious red wine. The Wine Battle is the main event of the Haro Wine Festival, happening every year in late June. The battle takes place in the early hours of June 28th, preceded by an all-night street party with lots of wine. 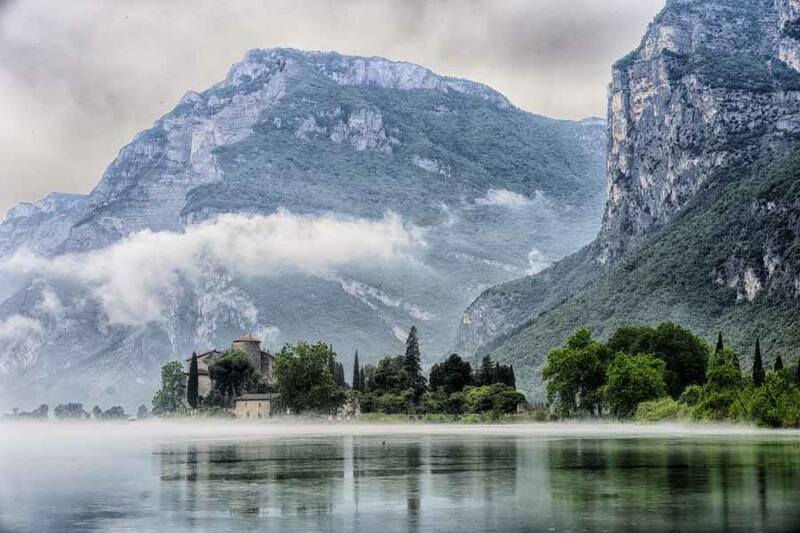 Revellers make their way to a mountain on the outskirts of town, throwing wine on one another with buckets, super soakers and pretty much anything… with no mercy! If you like wine, add this Spanish festival to your list. 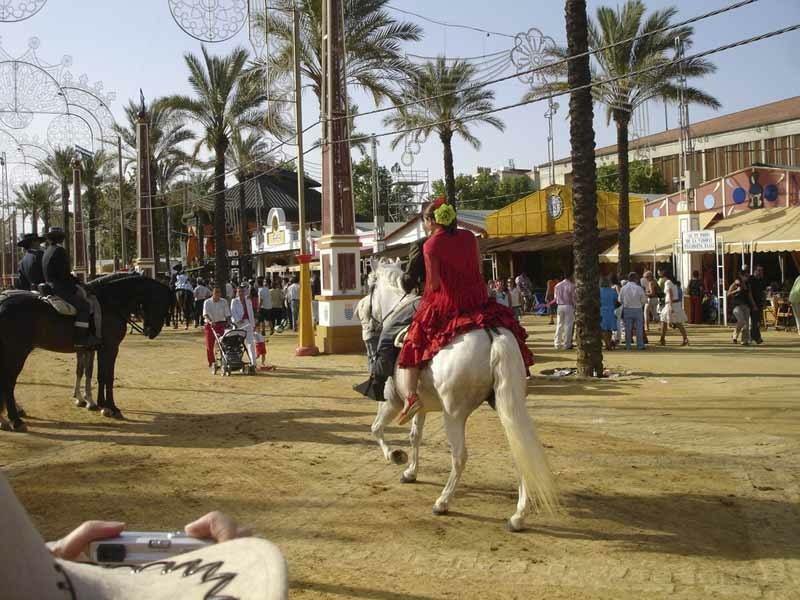 After Seville’s Féria de Abril, it’s worth sticking around Andalusia for another wonderful Spanish festival – the Féria de Caballos in Jerez de la Frontera. The fair dates back to medieval times when Jerez was an important horse trading post, and nowadays features horse and carriage processions, horse rides, and parades to showcase the beautiful horses from the region. There’s also a section with casitas and amusement park rides, similarly to Sevilla, but with the difference that in Jerez all casitas are public! When will it take place in 2019? May 11th to May 18th. Most Andalusian festivals take place around Easter, with one exception – the August Fair in Malaga, definitely one of the best Spanish Festivals in the entire year. This weeklong festival started being celebrated in 1487 to celebrate the return of the Catholic kings to the city, and it keeps going strong to this day, with street parties, concerts and stunning light displays all over the city. 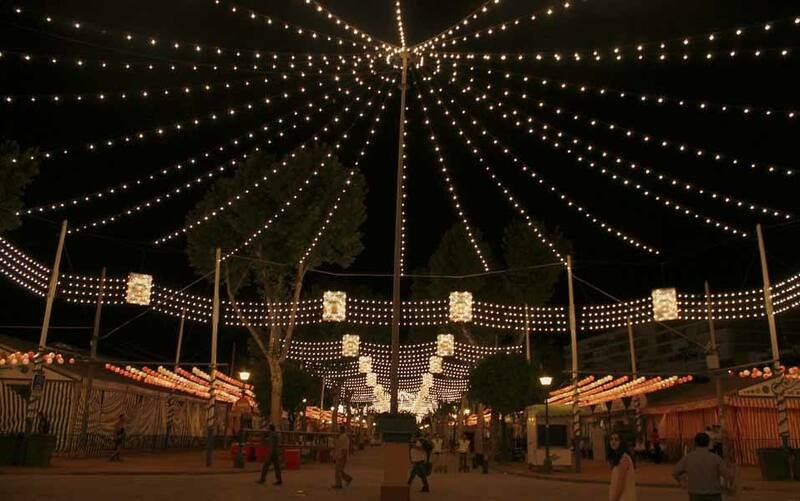 The Féria is divided in two parts – the Féria de dia, taking place during the day around the historic centre with music and dancing in the streets, and the Féria de noche, taking place in the Real de la Féria fairground, with fireworks, street food and park rides. It’s fun to visit both during the day and night! When will it take place in 2019? August 10th to 19th. Spanish festivals are not all massive street parties – there are also smaller, mysterious events like the Hombres de Musgo, taking place in Bejar on the day of Corpus Christi. Men dress up in a full body suit made of moss, to remember a 14th century battle when Christian soldiers camouflaged themselves as moss, to attack the fortress of Bejar. It’s a great honour for locals to be chosen to be a ‘hombre de musgo’, and it takes hours to be wrapped in the mossy suit, before parading around town walking and swaying slowly. When will it take place in 2019? June 23rd. Another Spanish festival that can definitely be referred to as bizarre is the Festival of Near-Death Experiences, held every year on July 29th in a small Galician village. During the festival, people who had near death experiences over the past year travel to the village with friends and family carrying a coffin. Once they’ve arrived, they lie into the coffin and pretend to be dead, while their family members carry them along a route that ends at the cemetery of the Santa Maria de Ribarteme church, where they pray the Saint’s statue. When will it take place in 2019? July 29th.